The competition for current and prospective students is tough and how you interact with them on social can make all the difference. You can turn your institution’s platforms into robust and valued assets by tailoring your social strategy to prioritize recruitment and retention. At Seneca College, we’ve had great success with five strategies. Use a social media management platform to listen when prospects are talking about you, particularly when they’re not tagging you. According to The Complete Higher Education Playbook from Sprout Social, “Nearly two-thirds of high school students use social channels to research schools, and approximately the same amount of prospective students said social conversations influence their choice of school.” Many prospects announce the schools they’ve been accepted to on social and ask for advice from their friends and followers on which school to choose. This is your chance to jump in ahead of the competition and engage in prospective student conversations. A creative, friendly, and engaging response may tip the scales in your favor. Give prospects the white-glove experience. “Millennials are 247% more likely to be influenced by social than the general population, and 62% of them said they’re more likely to be loyal to organizations that engage with them on social.” (The Complete Higher Education Playbook by Sprout Social.) On the other hand, after following Millennials and their well-documented tuition-related debt, GenZ prospects want to make the most financially responsible choice possible (Communicating with Gen Z by twgplus). Use your resources to make sure that GenZ prospects feel like they’re making the right choice and ensure that Millennials feel engaged. A little personalized attention can change your position from their second choice, to their first choice. 3. User Generated Content (UGC). Share images by future, current, and former students. “People are twice as likely to share UGC with family and friends, and over 50% of people trust it more than information found on a branded website,” according to The Complete Higher Education Playbook by Sprout Social. The best part is, the more you share UGC, the more your followers are likely to tag your account, creating a feedback loop of more high-quality potential content that will improve brand advocacy. The numbers don’t lie. UGC makes up 75% of Seneca’s top 15 most-liked posts on Instagram over the past two years. It’s much cheaper to keep the students you already have than to find new ones. 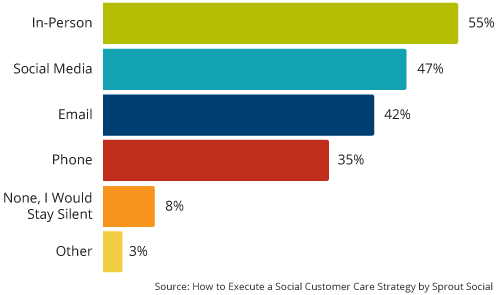 This is where you can use your social strategy to impact retention by ensuring the best possible customer experience. Social is the number two channel for consumer complaints at schools across North America. If you don’t already have one, write a customer service policy specifically for social and allocate resources to provide effective customer care. Another by-product of providing responsive support to your followers is that prospects will see that, while no school is perfect, yours acknowledges its pain points and does its best to help students in their times of need. 5. Cultivate Brand Ambassadors: Where Recruitment Meets Retention. Through social media, we have the unique opportunity to follow a prospect from the time they first show interest in our institution, to their first day of school, to graduation, and even after as an alumnus. When you take the time to give prospects a personalized touch on social and provide them with warm and helpful customer service during their time at your school, chances are that you’ve created a happy graduate. And who better to spread the word about your amazing school to future prospects than your alumni? It may even spark some amazing UGC, if you’re lucky. Social media as a recruitment and retention tool is here to stay and will only grow with time as traditional forms of communication dissipate into the past like home phones and cassette tapes. While resources are often tight, use what you have to narrow your focus to nurturing prospects and retaining current students to see the greatest return on your investment. Don't want to miss a single post from Campus Sonar? Subscribe to our monthly Brain Waves newsletter to get the latest and greatest about social listening in higher education delivered right to your inbox. The post Five Tips for Creating a Social Media Strategy that Pays Off originally appeared on the Campus Sonar Brain Waves blog. Rema Tavares is the Social Media Specialist at Seneca College. The role allows her to combine her love of art, education, strategy, and data analysis. Prior to this position, Rema was the Executive Director of the Sky's the Limit, a national-registered Canadian charity that provides refurbished laptops and STEM training to marginalized youth. Kayla Lewis is Seneca College's Associate Director of Communications and PR. She's passionate about higher education, brand reputation management, and the power of social media. Based in Toronto, Kayla oversees the PR team at one of Canada’s largest and most comprehensive colleges. Over the past several years, Kayla has led Seneca’s social media team in improving engagement and customer service across a variety of platforms. If you're doing something interesting with social listening, we want to know! Tell us your story and how you're using social listening to drive strategy on your campus. Become a guest blogger for the #BrainWavesBlog.